Philadelphia's poverty rate, a stubborn and entrenched indicator of hard times, remained stagnant in 2016, even as poverty declined throughout America. Philadelphia retained its unenviable designation as the poorest of the 10 most populous cities in America, recording the highest rate of deep poverty — people living at 50 percent of the poverty line or less — among big cities. Philadelphia's 2016 poverty and deep-poverty rates were statistically the same as in 2015 — 25.7 percent and 12.2 percent, respectively. Meanwhile, more than 37 percent of the city's children were living in poverty. The data come from the U.S. Census American Community Survey released Thursday morning. Census figures are adjusted to 2016 dollars. "It's incredibly disheartening to see that Philadelphia hasn't shared in the gains seen nationally," said Kathy Fisher, policy director at the Greater Philadelphia Coalition Against Hunger. "And it's unacceptable that we still have a third of our children growing up in poverty." Throughout the region, results were mixed. Median household income increased by 6 percentage points in Burlington County, which also saw its poverty rate decline. But in Bucks County, as income plummeted 8 percentage points, poverty spiked a bit. Chester County registered a noticeable rise in poverty, but experts in the county — which saw a rise in income — dismissed it as a statistical glitch. The poverty rate for Pennsylvania in 2016 was 12.9 percent, slightly above the U.S. figure of 12.7 percent. In New Jersey, the poverty rate was 10.4 percent. Both state figures were slightly less than in 2015. The median household income in Pennsylvania was up slightly to $56,907, while New Jersey's saw a large 4 percentage-point gain to $76,126. 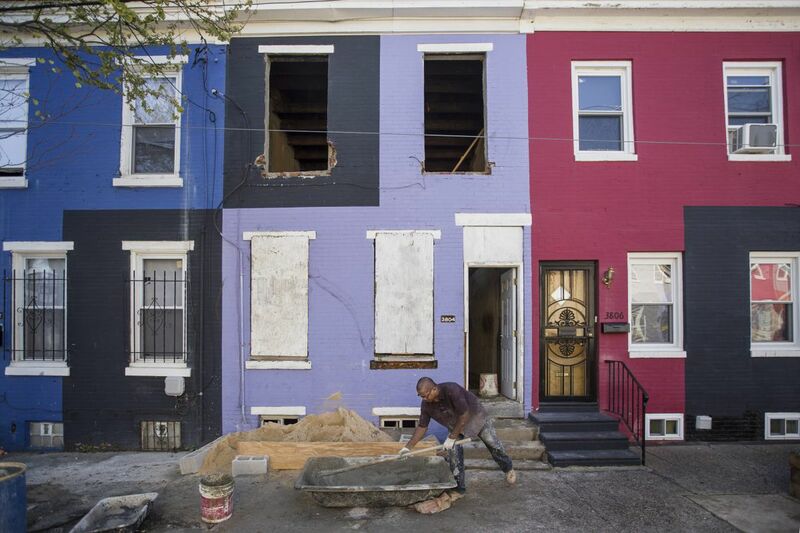 In the city of Camden, the poverty rate was 30 percent. The good fortune enjoyed by many residents of Pennsylvania and New Jersey didn't always transfer to Philadelphia, where nearly 400,000 people live wearying and dispirited lives under the poverty line, or just above it. "I have to be a survivor in every form," said Ronnie Jackson, 45, a West Philadelphia mother of a 2-year-old daughter and 11-year-old son in the process of getting a divorce. She makes less than $24,000 a year as a home health-care worker, a few thousand dollars above the poverty line. Her rent and utilities run to $700 a month, and her car payment eats money. "You stay in touch with people to hear if they have some leftover cabbage," she said. "You go to food pantries. I have a boy that eats like a man. Definitely, there are times I don't eat so the kids can. A cup of coffee can kill the appetite." Jackson, who was one year away from completing a college degree in business, doesn't have cable TV and buys fish sticks in bulk. At 119 pounds, she said she doesn't need too much food and wonders, "What do other parents with bigger appetites do?" "Life," she concluded, "is uncomfortable." Trying to explain the city’s “extraordinarily high poverty rate,” Drexel University economist Paul Harrington said that job growth in Philadelphia and Pennsylvania as a whole has lagged behind national averages for several years, inhibiting any real chance to reduce poverty. Also, while the city provides better-educated millennial newcomers and suburban commuters "very high-end" jobs in science, engineering, and health careers, the bulk of the rest of the available work in Philadelphia is low-paying, largely in the leisure and hospitality sector, Harrington said. Beyond that, he added, a large proportion of the city's working-age residents don't work at all because of low reading, writing, and math skills. Temple University sociologist Judith Levine agreed, saying most of the city's workers don't match up with the lucrative "meds and eds" jobs that attract a more educated tier of job seekers. That's because the city suffers from a "deeply problematic school system" that fails to train young people for work. Schools, she added, are vastly underfunded by the state. Offering a contrary view to the mostly gloomy census report, Mark Zandi, chief economist with Moody's Analytics, said that while it's true the city has a large, disenfranchised community that can't find decent work, "unemployment is declining, and we see consistently growing jobs data in the Philadelphia economy." He said he believes the numbers don't tell the full story. Zandi added that Philadelphia's job and growth statistics will be seen to have improved in 2017. In Bucks County, the deteriorating signs of increased poverty and fallen income didn't surprise Marissa Christie, president and CEO of United Way of Bucks County. "Suburban poverty is going to continue to increase," she said. Several solid companies, like Lockheed Martin, left the county in recent years, Christie said. What's more, "trend lines are moving in the wrong direction," she added, saying that impoverished people from Philadelphia have been moving into Bucks County to escape unsafe schools. But people are soon faced with being "rent burdened" — stymied by using more than one-third of their salaries for rent. The percentage of children identified as being hungry has been increasing over the last 18 months, she added. Also, the opioid crisis has ravaged the county, Christie said, referencing the large number of drug-recovery houses in the area. "When you're dealing with a chronic issue like drug abuse, the odds that you'll be gainfully employed are not good." On the other side of the river, the story was different in Burlington County. Poverty is down and the median income shot up from $75,745 in 2015 to $80,254 in 2016, census figures show. Renee Koubiadis, executive director of the New Jersey Anti-Poverty Network in Ewing, Mercer County, said that people in high-end jobs were doing even better, increasing their salaries over the last few years. And, she added, there's been a countywide trend of residents in part-time jobs during the recession now able to move to full-time work. Also, the Affordable Care Act helped move some people out of poverty by lessening the burden of high health costs, she said. As for Philadelphia, Fisher of the Coalition Against Hunger said it's great that Center City is improving, but she continues to see very high demand for food assistance across the city, an indication that the census figures may, sadly, be on the mark. She added that proposed cuts to the hunger safety net recently voiced by Congress would only make a festering situation collapse. The cuts, Fisher concluded, "would not only prevent Philadelphia from sharing in continued national progress, but actually increase poverty and inequality."